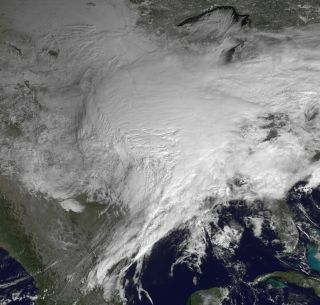 The massive winter storm that is roaring across the U.S.
As satellite photos reveal spectacular photos of the massive winter storm blasting across the United States, some may recall another huge storm that struck almost 18 years ago — the notorious Storm of the Century. "This really is a drop in the bucket compared to that superstorm," Rich Otto, a meteorologist with the National Weather Service, told OurAmazingPlanet. The storm on Jan. 31, 2011. Today's storm started with cold air shooting unusually far south from Canada. This extremely cold airmass prefers to move west to east but the Atlantic atmospheric circulation is blocked, so it's forced to go south, said Jeff Weber, an atmospheric scientist at the University Corporation of Atmospheric Research in Boulder, Colo. The fenced-in arctic blast met a pocket of cold, swirling air that had formed thousands of feet above the ground over Texas. Meanwhile, up ahead, winds began blowing warm, moist air from the Gulf of Mexico. That juicy air moves over the cold air, fueling the precipitation that is falling across much of the country as the system moves northeast, Otto said. Areas directly under the disturbance — such as St. Louis — are seeingfreezing rain and sleet. Areas to the north — such as Chicago — will see heavy snow, and areas to the south — much of the southeast — will see mostly thunderstorms and rain. The Storm of the Century in 1993. The 1993 storm had a similar beginning, but it took an ocean detour before moving northeast. That storm grew stronger as it fed off the energy of the Gulf of Mexico and the Atlantic Ocean. Today, the Gulf of Mexico is all that is powering the winter storm. The extra ocean energy made the 1993 superstorm much stronger than today's storm is forecast to become, said Jake Crouch, a climatologist at the National Climatic Data Center in Asheville, N.C.
One way to gauge a storm's intensity is by measuring what's called the minimum central pressure of that storm. The lower the number, the more intense the storm. The 1993 storm bottomed out at 960 millibars (standard atmospheric pressure, or the weight of the air above the surface, is about 1,013 millibars). Today's storm may come close to that intensity, but it is not forecast to surpass it, the scientists said. The current storm won't match the 1993 superstorm in snowfall either. In 1993, parts of upstate New York were hit with 30 to 40 inches (75 to 100 centimeters) of snow in 1993. "We're not expecting any snowfall that intense with this storm," Crouch said. The current storm may top the 1993 superstorm in one dangerous category — freezing rain. The current system is expected to bring more freezing rain over a larger area, creating treacherous conditions across much of the country, the scientists said.